Curry Goat Revenge – the endless runner with a spicy twist. 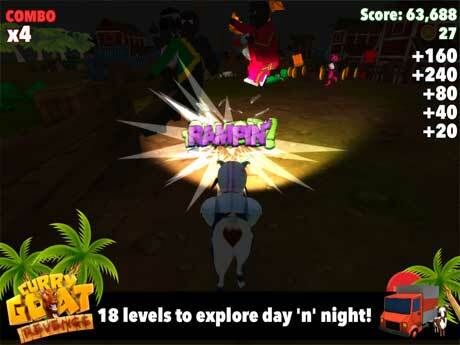 Compatible with most high-end android phones (e.g Galaxy S5+), the app features a comical Caribbean goat with a sole purpose to cause as much havoc as possible. Having seen his friends taken away in the van to the slaughterhouse, the goat’s mission is to seek revenge on the local people who have a penchant for curried goat dishes. The app’s colorful illustrations bring the rural surroundings to life, with palm trees, rocky roads and mountains gracing the landscape. 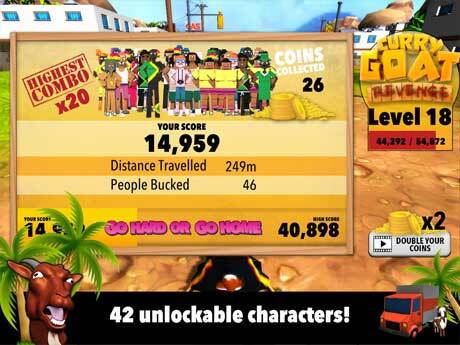 But this is far from paradise, as by playing the goat, users gain points by knocking over as many people as possible while avoiding the obstacles in their path. You will grow familiar with the catchphrases expressed by the goat as it mows down his foes. In addition to this, every character in the game has a backstory. 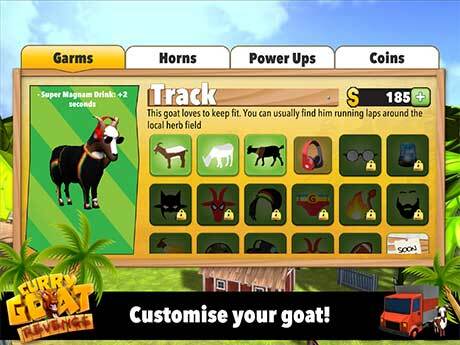 Users of the app will have the option to customise their goat by using coins to purchase items and garments.